Barrington Watch Winders are made from the finest quality materials and Barrington is one of the leaders in their field. Powered by 2 x AA batteries or AC mains the winder allows the user to set the direction and frequency of rotations per day. Barrington watch winders are renowned for being virtually silent and the resizeable cushion fits watches of all sizes and weights. The unit measures is cube shaped and measures 11.5cm in all directions. Winding cradle/cushion has an adjustable spring. At it’s largest setting it can fit a bracelet around 220mm, at it’s smallest it will fit a bracelet approximately 190mm in in size. These single watch winders come in multiple colours to match your set of watches or favourite colours. 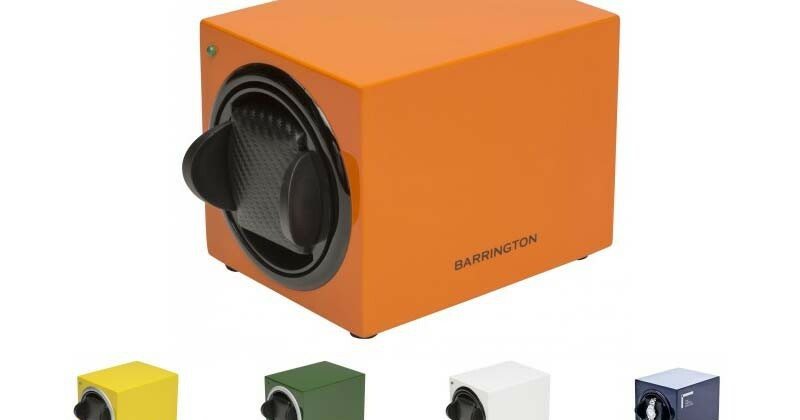 Buy your Barrington single watch winder from The Watch Gallery, click here! Barrington Watch Winders : Single Watch Winders 0 out of 5 based on 0 ratings. 0 user reviews.